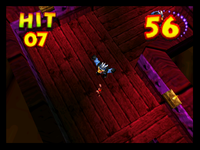 Mad Maze Maul is a Bonus Stage found in the game Donkey Kong 64. After the player jumps in the Bonus Barrel, they can play this game to try and win a Golden Banana. In this minigame, the player needs to navigate through a maze and defeat the required number of Kremlings in 60 seconds. The maze only contains Kritters and white-haired Kasplats (who do not have Blueprints). After the player defeats all the baddies in the maze, he can make his way to the checkered flag to clear the stage. This is one of the Bonus games that cannot be played in Snide's H.Q. after collecting all Blueprints. Destroy all the baddies, then head for the checkered flag! Mei ro de bakyūn! Bakyun in the maze! This is one of only three minigames in Donkey Kong 64 to not use the bonus stage theme used by all other minigames, the others being Stealthy Snoop and Minecart Mayhem. It instead has its own unique music track. Two other Mad Maze Maul challenges can be found in the game's coding, in the former the player has to defeat 10 baddies in 125 seconds, and in the later the player has to defeat 11 baddies in 120 seconds. Aside from Kritters and Kasplats, these unused challenges also contains Zingers (which can be defeated using weapons). In the latter Klobbers and one Klump can be found who can only be defeated using the shockwave attack (as the player cannot use Oranges in the stage, although there are some Oranges at one end of the maze.). This page was last edited on March 2, 2018, at 22:56.